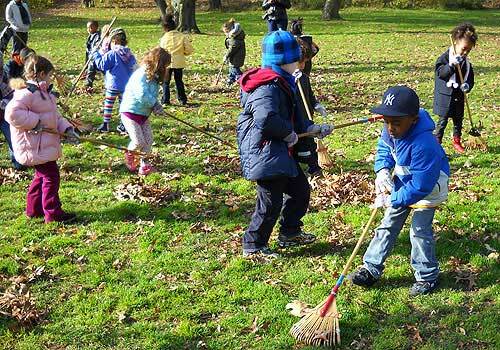 Give your students the opportunity to give back to Central Park and learn about good stewardship by helping our staff with seasonal projects. Projects are located throughout the Park based on the school’s location. Groups of up to 30 students in grades K-12 with at least two chaperones are welcome. Sessions take place in the spring and fall seasons from 10:00am-11:30am. Schools are limited to one session per season (1 in spring, 1 in fall). To schedule a session, please fill out the web form below, at least 3 weeks in advance of your preferred date. Once we have received this form, please allow at least three business days for us to follow up with you by phone/email. To register for School Group Volunteer Days, please submit the following information. Please visit our preferences page if you wish to edit or update your email preferences. Questions? Please contact us at volunteer@centralparknyc.org. Families interested in participating in a Family Volunteer Day, click here. Youth Education and Service Programs are supported in part by The Barker Welfare Foundation; Doris Duke Charitable Foundation; Epstein Teicher Philanthropies; Abraham Perlman Foundation; The Pinkerton Foundation; and William E. Weiss Foundation, Inc./Daryl Brown Uber.